The window cleaners and upholstery cleaners come this morning! Soon my apartment will be sparkly fresh and spring clean. And now, a Spring photograph. 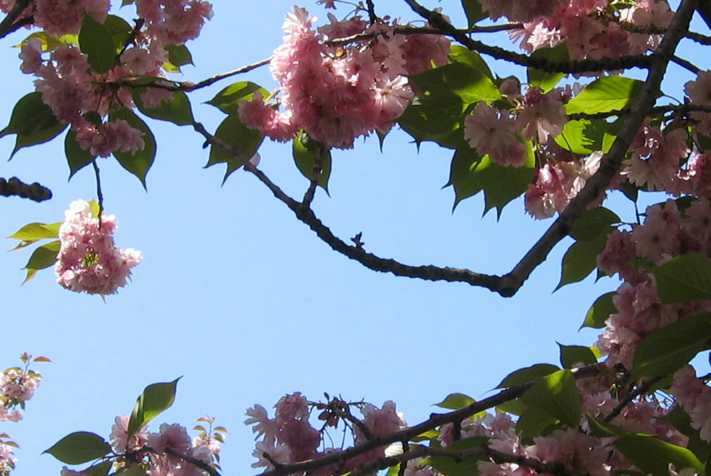 These are cherry blossoms at the Brooklyn Botanical Garden. Which reminds me, can someone tell me why flowers don’t smell as strongly as they used to? We walked through a row of lilac bushes and the smell should have knocked us unconscious, but I could barely smell them. I know that cultivated and man-made (hybrid) varieties don’t have much scent in flowers like carnations. Years ago, I smelled some home-grown and old variety carnations and was knocked over by the smell of cloves. The kind you get at the florist hardly smell at all. However, for lilacs, if the bushes have been there for years, I don’t know why they wouldn’t smell. If they were scented one year, they should be scented the next. Maybe they were new? Yeah, that’s what was so weird about it — I’m pretty sure those bushes have been there for a while. There was a scent but it was faint. I remember when I used to be able to get one bouquet of lilacs and my entire apartment would be filled with their scent. You could smell it the second you opened the apartment door.